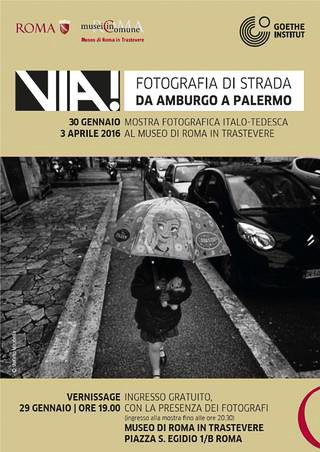 ‘”Via!” – Fotografia di strada da Amburgo a Palermo’ is a photography exhibition that is taking place at the Museo di Roma in the Trastevere district of Rome until the 30th April 2016. ‘Via’ is the Italian word for both ‘go’ and ‘street’ – using a play on words – while the rest of the exhibition’s title can be translated as ‘Street photography from Hamburg to Palermo’. The exhibition is the result of a photographic project that was started in 2014 by the Goethe Institut. Throughout one year, ten photographers, five in Germany and five in Italy, photographed public places in their cities according to the regulations of street photography. You will visit the streets of Augsburg, Berlin, Hamburg, Iserlohn, Bologna, Naples, Rome, Palermo and Treviso; spontaneous moments of everyday life that can also often be extraordinary, humorous, touching and even confusing at times. The exhibition is the result of a photographic project started in 2014 by the Goethe-Institut. Ten photographers, five in Germany and five in Italy, in a year they photographed their cities according to the canons of street photography. Created and defined by the works of Henri Cartier-Bresson, Elliott Erwitt, Robert Frank and Alex Webb, this kind of spontaneity lives of the fleeting moment. Its situational character is a result of the deliberate decision to actively influence the shooting situation, eliminating, therefore, the timing, the perspective and the image cut. The images on display were taken from Hamburg to Palermo, through Berlin, Naples, Augusta, Treviso, Bologna and many other German and Italian cities. From the perspectives of ten photographers it was born a collection of pictures of spontaneous moments of everyday life. Some photos, abstract from where they were taken, they possess a universal expressive power. In others, the architectural details, the light or the attitude of the depicted people leave clues on location shooting. Full of humor, scurrilous, touching, enigmatic or confusing, photographs disclose the significant geographical, social and cultural rights of the individual regions. The team of photographers to “Go!” Is made in Germany, by the editor Fabian Schreyer (“The Street Collective”) of Augsburg, by the member of “Public-In” Siegfried Hansen Hamburg, the Berlin photographer Guido Steenkamp, by Marga van den Meydenberg, Dutch photographer in Berlin, as well as by the member of “Observe” Michael “Monty” May Iserlohn. 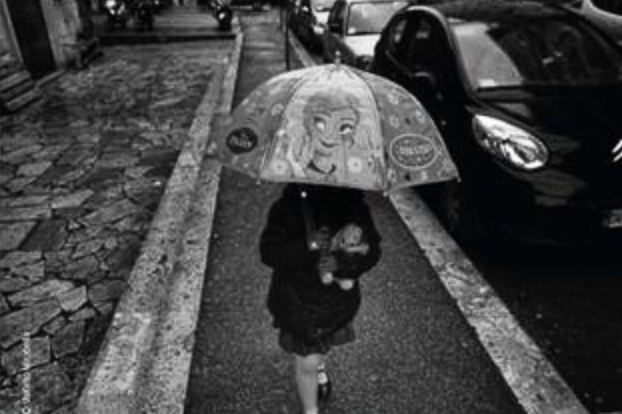 Italy is represented by Umberto Verdoliva (“Street Photographers”, “spontaneous”) of Treviso, Mary Cimetta di Bologna and Stefano Mirabella Rome (both “spontaneous”) as well as Michael Liberti (“EyeGoBananas Collective”) of Naples and Palermo Giorgio Scalici.